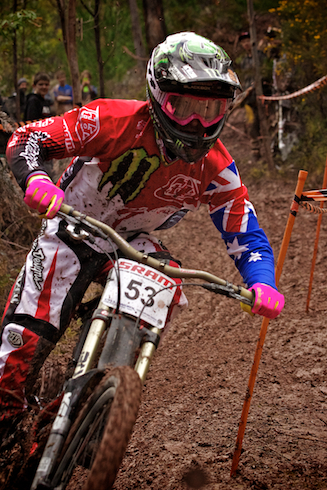 Last weekend the 5th round of the South Australian Downhill series was held up at the always popular MTB mecca that is Fox Creek. 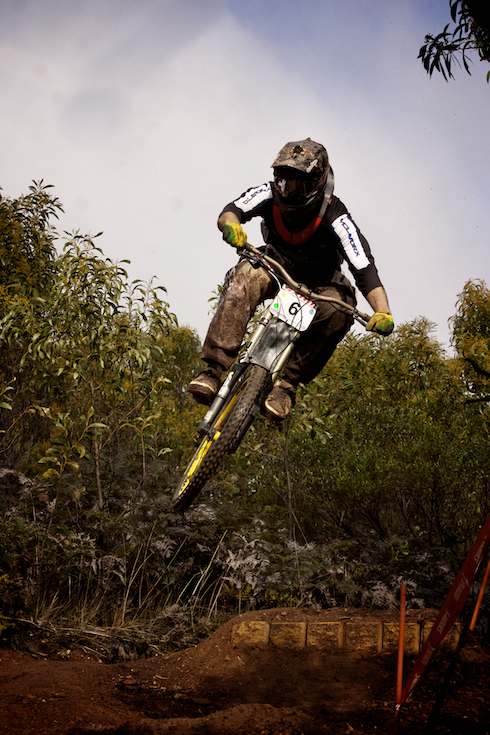 Fox has been raced at for over a decade and has a great trail network for all types of riding. Although the track used, officially called “Fox Creek Fast”, has been round for a few years, this was the first time a race was held on this course specifically. The boys had been eagerly digging and prepping the track over the past two weeks. Some new doubles and big gaps made the course super quick, and it was really living up to its name. That was until of course, race day! Ngari Jenkins loves hangin it all out. It seems to happen all to often at SA MTB races, and this was no different. Come Sunday the gods let loose with rain all night and strong cold winds and multiple showers throughout the day. This resulted in a very boggy track, since the most is thick red clay. After a few months off after a massive injury, it was good to see Troy back on the bike racing again for the first time since his big off in Austria earlier in the year. Tyson floating over one of the biggest gaps up near the top of the course on his seeding run. One person that wouldn’t have minded if Troy had just sat this one out, Tyson Schmit, who stormed onto the podium for the first time in 2nd place, behind Troy. 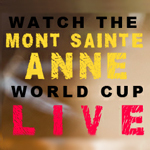 Another World Cup downhill race is on again. For the fourth round of the UCI series we head back to last years World Champs hosts, Mt Sainte Anne, in beautiful Quebec, Canada. This 2.83km track is renowned as one of the roughest on the circuit. With relentlessly fast wide open rocky sections under the chairlift flowing in and out from the forested areas this race brings loads of fans out to watch and sorts out the boys from the men. The weather is looking better this year, opposed to the atrocious conditions we saw last year. With the forecast for mid twenties the sun should be out all day, let’s just hope the winds don’t pick up to much. Have a look at some highlights from the last few days. 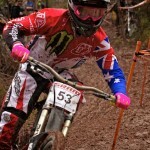 Going by his form form in the previous races it’s no surprise to see Aaron Gwin on top of the qualifying list. Great to see a big field of Aussies in the list, especially so many juniors representing their country and gaining valuable experience on the world cup circuit. 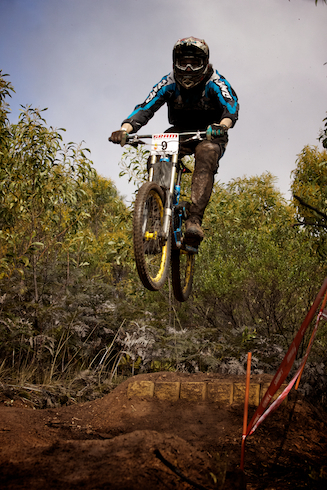 Connor Fearon, Under 19 Aussie National Champion has done exceptionally well, qualifying in 28th, and we’re hoping his great form continues on into the finals. In the womens field Tracey Hannah is continuing her good form qualifying in 4th, only 8 seconds back from fastest qualifier Rachel Atherton.